Rupert Lowe is to step down as chairman of Southampton Football Club following a power struggle with shareholders. He made the announcement ahead of an Extraordinary General Meeting (EGM) on Monday, called by major shareholder Michael Wilde to try to unseat Lowe. 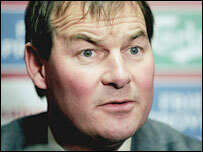 Jersey-based Wilde, who owns nearly 25% of the club, has led a consortium of local businessmen who want Lowe out. Lowe's decision comes after Leon Crouch, who owns nearly 10% of shares, said he would back Wilde at the EGM. Lowe, who has a 6% stake in the club, had been under mounting pressure after 10 years as chairman, with discontent among many fans reaching an all-time high. Following Lowe's resignation the parent company, Southampton Leisure Holdings Plc, announced the appointment of six new directors including Wilde, who has also become chairman of the football club board. Wilde said: "Clearly we have a great deal to do, particularly in the pre-season period. "We will commence an immediate review of each aspect of the business and will be speaking urgently to George Burley to establish the resources he needs in both the short and medium term." During Rupert Lowe's reign, Saints moved to a new stadium, reached the FA Cup final, finished eighth in the Premiership and returned to European football for the first time in 20 years. But the club's relegation from the Premiership in 2005 for the first time in 27 years was the last straw for many fans. Crouch, Saints' second biggest shareholder, was being courted by both Lowe and Wilde, as his decision would ultimately decide the club's fate. But he told BBC Radio Solent: "Rupert has done some good things but I think it's time for a change at the top." Wilde called an EGM of the parent plc after failing to compromise with Lowe. Lowe then called an EGM of the football club board, where three directors who sold shares to Wilde were sacked.